"(Question) How do you make a game better than Dead or Alive 2? Dead or Alive 3 is the much anticipated fighter for the XBox gaming system by Tecmo. 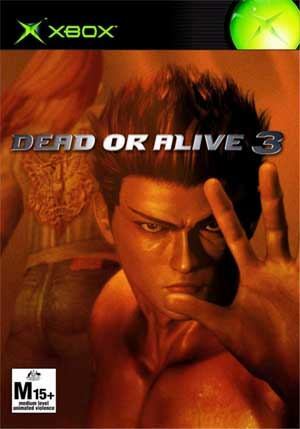 DOA3 (Dead or Alive 3) is probably one of the most amazing fighters on any gaming console. The graphics are just stunning and the detail level truly pushes the XBox to its limits, from leaves falling from trees or a gently snow storm. The game keeps a consistent 60 frames per second while pushing huge detailed backgrounds around and detailed polygonal characters. The game starts off with a beautiful cinematic introduction, featuring the characters in the game and the backdrops where you will be fighting. As with all the DOA series, the CGI and in-game movies are outstanding. DOA3 features the same anime type characters from the previous game, Dead or Alive 2, however there are dozens of moves for each character from punches to super throws. 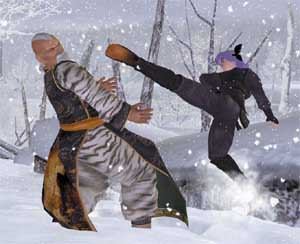 The beauty of the DOA series is that you don't need to be a fighting game expert to perform some wickedly amazing moves. As you progress through the levels, the AI will soon develop blocks and counter-moves to your attacks, so you just can't get away with doing the basics such as kicks and punches all the time. The game is not just for novices as you can select a difficulty level which will surely have experts shouting for joy or frustration. As with the previous game, you can throw and kick your opponents through the different environments you play, that is, with a well performed manoeuvre, you can send your opponent flying through a wall or off a dangerous cliff. DOA3 features some highly detailed characters you can choose from, with each having their own unique story. That is, if you select story mode, you can learn about the character and their motivations. Once you have completed story mode, you can choose other modes of play that will surely keep you glued to your TV screens. The main problem of this game for the XBox is that Dead or Alive 2 was just damn too good. Fans of the previous game will just think this is a re-hash with a few extra touches. Although this may be the case, why not bring one of the best fighting games over to the XBox? Even though this game will eventually be brought out on the PS2 and GameCube, neither of these systems will have the same sharp graphics of the XBox version. I thoroughly recommend this game to all XBox owners as not only will you have a ball playing this, the multiplayer modes are great for beating up friends. Highly Recommended!